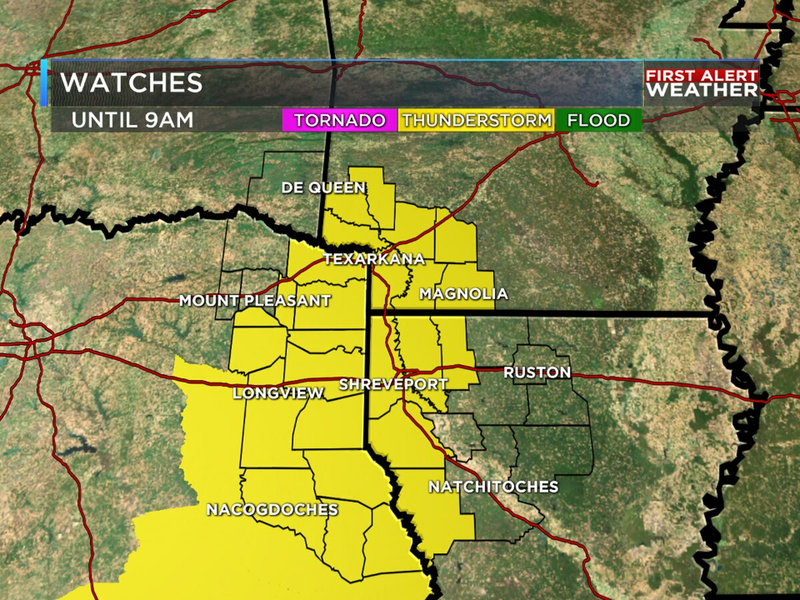 A line of strong to severe storms will blast through the ArkLaTex tonight through Thursday morning. Strong to severe storms could make for a dangerous commute to work first thing Thursday morning. 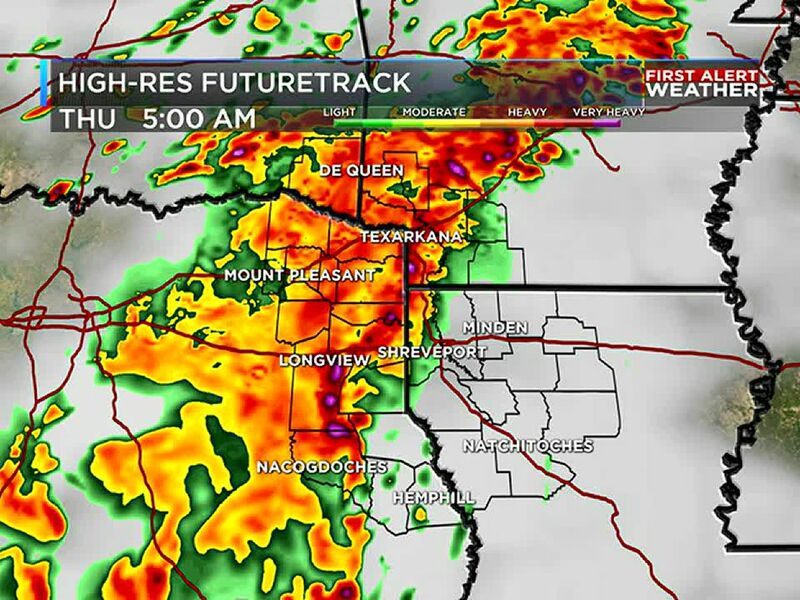 There is the potential the KSLA First Alert Weather could be tracking two rounds of strong storms late Wednesday evening through Thursday morning. The latest run of FutureTrack shows the potential for a cluster of strong storms to develop across portions of E TX, SE OK and SW OK late Wednesday evening. However, there is some uncertainty on if these storms will develop this evening because there is a cap, or lid, in the atmosphere that could prevent storms from firing up. Most of the area will not see rain and storms until after midnight on Thursday. A line of strong to severe storms will push from west to east across the area Wednesday night through Thursday morning. 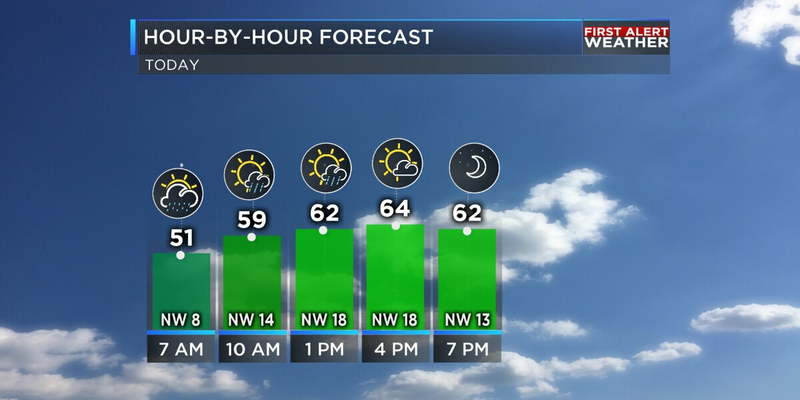 The video below will show you the latest hour-by-hour forecast with FutureTrack and the latest timing of the strongest storms. This line of storms should weaken as it moves from west to east across the area Wednesday night. The greatest threat of severe weather tonight will be across portions of E TX and SE OK. The area highlighted in orange is under an ENHANCED risk of severe weather. The latest severe weather outlook for today and tonight has trimmed the ENHANCED risk area back. Most of the area is under a SLIGHT Risk of severe weather. This is the area highlighted in yellow. The rest of the area will be under a MARGINAL risk of severe weather. Even though the line should weaken as it moves through the area, strong to severe storms will be possible across the entire area. All modes of severe weather will be possible tonight: strong to damaging wind gusts, hail and a low threat of tornadoes. With a line of storms, the main threat will likely be strong to damaging wind gusts, especially were the line bows. A quick-spin tornado will be possible along the leading edge of the line of storms, though. The hail threat will likely be a little higher with the storms that develop late Wednesday evening compared to the line of storms that develops overnight. Hail will still be possible within the strongest parts of the line of storms, though. Localized heavy rain and flooding will be possible as well. Most of NW LA and portions of E TX and SW AR will be under a FLASH FLOOD WATCH from 7 p.m. Wednesday to 7 a.m. Thursday. Locally heavy rainfall of 2-3″ of rain will be possible within the watch area. Most of the area has seen a lot of rain recently, and additional heavy rainfall over a short period of time could cause additional flooding problems. The threat of severe weather will likely end for your area when the line of storms passes you Wednesday night or Thursday morning. More rain could develop behind the main line of storms, so rain could continue into Thursday. For most, the threat of severe weather will shift east of the area on Thursday. However, there is still the potential a few strong storms could redevelop late Thursday morning or early Thursday afternoon across the very southeastern corner of the ArkLaTex before the greatest threat of severe weather moves east of the area. With the threat of severe weather coming through overnight, it’s extremely important to have multiple ways of getting severe weather alerts. You also need to make sure those alerts will wake you up if you are sleeping when a SEVERE THUNDERSTORM or TORNADO WARNING is issued for your area.